There is no better way to cook collard greens than low and slow. These Slow Cooker Collard Greens are a healthy classic Southern recipe. Nutrient-packed, this soul food may help to lower cholesterol and boost the immune system. 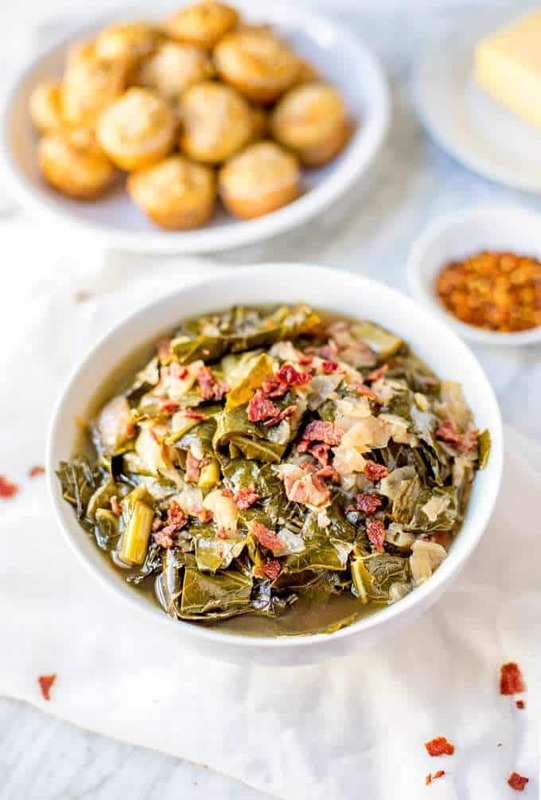 Tangy vinegar brightens the earthiness of the collards, and crushed red pepper adds the perfect amount of heat. The perfect side for a relaxed weekend dinner! 2.1 What is the Best Way to Cook Collard Greens? 2.2 What Should I Serve with Collard Greens? 2.3 Are Collard Greens Good for You? 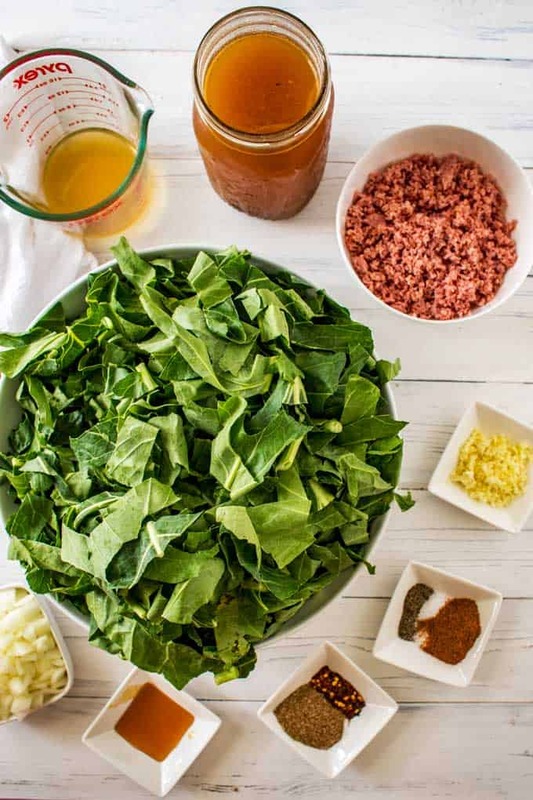 5 How Do You Cook Collard Greens in a Slow Cooker? As a Southern girl, collard greens have always been a part of my diet. I have early memories of sitting on a stool watching my mother cook a big batch of collards that we had just picked from my father’s garden. Although at the time I wasn’t as enthusiastic about eating the greens as I am now, I always loved to help make anything we had grown. There is something special about cooking food that you planted. These days, I like to make my collards in the slow cooker. Yes, I love my Instant Pot. But there are a handful of recipes that are just better in the crockpot. 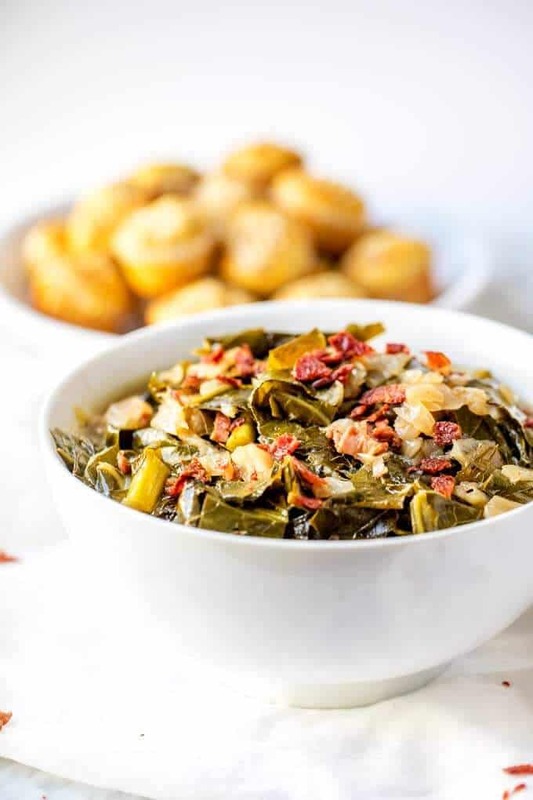 These Slow Cooker Collard Greens are the perfect example. Cooking them low and slow is the perfect way to get perfectly tender collards, without a hint of the bitterness that can come with overcooking them. Plus, I love not to have to babysit them the way that I would if I prepared them on the stove top. This recipe is a fabulous way to add more green to your diet, without having yet another salad. Nothing against salads, mind you. You guys know that I love them. But every now and then a big bowl of cooked greens are just what you need. I like to make this recipe on the weekend when I know I am going to be home all day. That way when dinner time rolls around I’ve already got part of it done. It is also a recipe that I make anytime I get sick. It always seems to give my immune system the boost it needs. What is the Best Way to Cook Collard Greens? 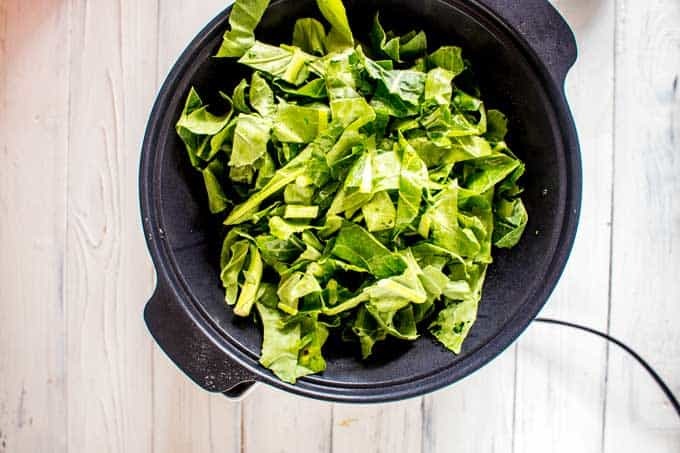 The slow cooker is the best way to cook collard greens! It is so easy to overcook them and when you do they can start to taste bitter. Additionally, they lose some of their nutrients when they are overcooked or cooked at too high of heat. 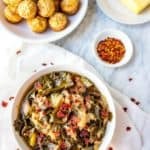 What Should I Serve with Collard Greens? Are Collard Greens Good for You? Collard greens are one of the best dietary sources of vitamin K, which plays an essential role in strengthening bones and lowering inflammation. One study found that those who had the lowest levels of vitamin K intake from food has a significantly higher risk of developing diabetes. It is also rich in eye-protecting nutrients such as lutein, which can help protect your eyes from the blue light given off by your computer screen. 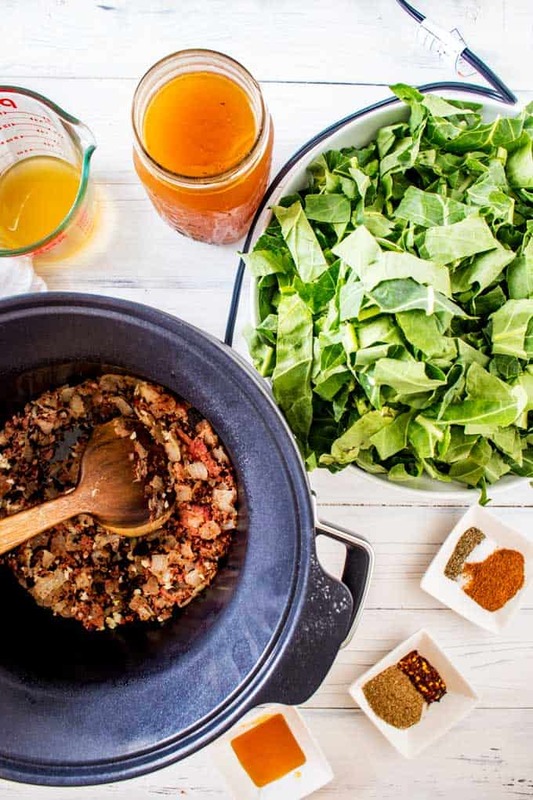 For Vegetarian and Vegan Slow Cooker Collard Greens, omit the bacon. Prepare the recipe as directed and add in 1 tablespoon of smoked paprika and 1 teaspoon liquid smoke. If you eat pork, you can substitute pork bacon or a Ham hock for the turkey bacon. For an extra touch of sweetness, increase the honey to 2 tablespoons. Look for collard bunches that have sturdy vibrant leaves and stiff stems. 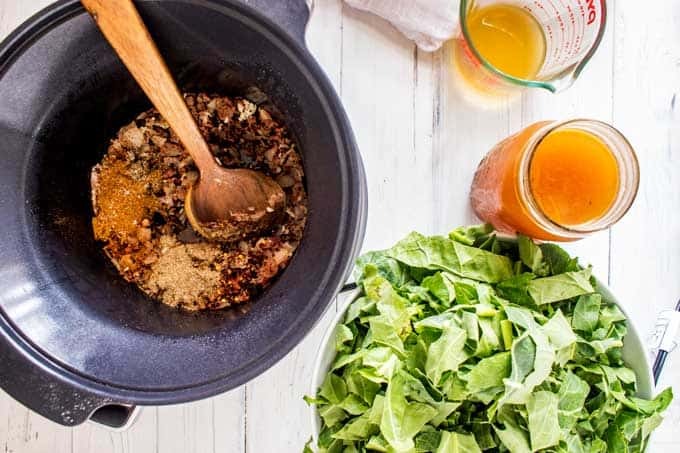 How Do You Cook Collard Greens in a Slow Cooker? 2. Spray your slow cooker with cooking spray, and set to sauté. If your slow cooker doesn’t have a saute function, use a skillet. 3. Cook the turkey bacon for 5 minutes. 4. Add the onion and cook 8 more minutes. 5. Add garlic and cook 1 more minute. 6. Change the mode to slow cooker. Add chicken broth, collard greens, apple cider vinegar, Old Bay seasoning, celery seeds, honey, crushed red pepper flakes, black pepper, and sea salt. 7. Cook on low for 8 hours or high for 4 hours. If you’ve tried this Turmeric Rice or any other recipe on the blog then don’t forget to rate the recipe and let me know how it went in the below comments, I love hearing from you! You can also FOLLOW ME on FACEBOOK, TWITTER, INSTAGRAM, and PINTEREST to see all my delicious recipes. 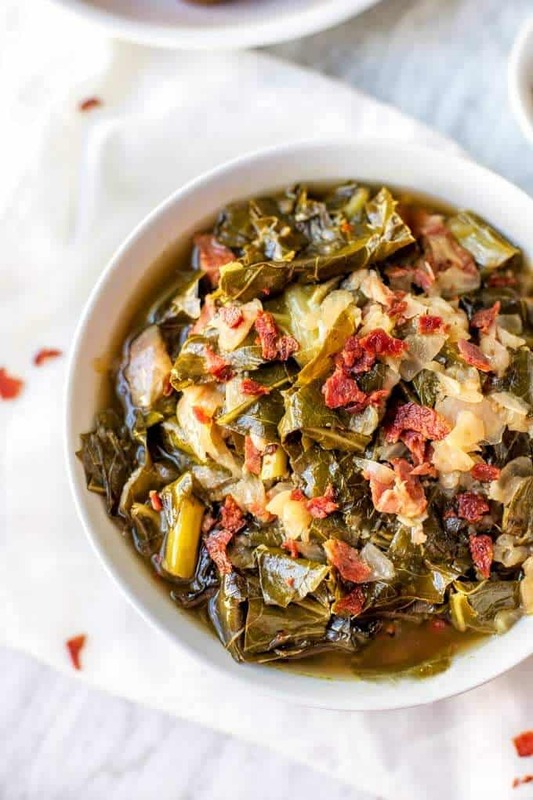 These Slow Cooker Collard Greens with Bacon is one of those easy recipes that will have your reaching for your crock pot time and again. A great Southern style side dish for the holidays or New Years. Spray your slow cooker with cooking spray and set to saute, Cook bacon for 5 minutes. Add onion and cook 8 more minutes. Add garlic and cook for 1 minute. Alternatively, if your slow cooker does not have a saute function, use a skillet and follow the directions as written. Transfer to your slow cooker and proceed with the recipe. Change to slow cooker. Add chicken broth, collard greens, apple cider vinegar, Old Bay seasoning, celery seeds, honey, crushed red pepper flakes, black pepper and sea salt. That looks delicious! I love collard greens. They are delicious, and they’re so good for you. I can’t wait to give this a try. Om nom nom. I have to make this! You know, I love greens, but I’ve never had collard greens. I can’t wait to try these. They look delicious. I love collard greens! they’re so flavorful and very good for you. I’ll bookmark this recipe to make soon! It is amazing the things you can make in a slow cooker, I really should get more adventurous with mine. This sounds like a delicious healthy meal. This looks really good! I’ve never had collard greens. I am always looking for new slow cooker recipes! I dont use mine near as much as I could or would like too! The slow cooker sounds cool! 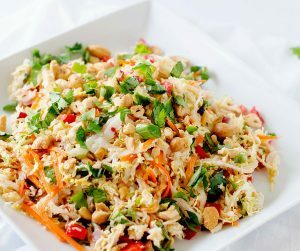 I would love yummy and easy food with fewer dishes while preparing. lol! I would love to try your recipes! This recipe sounds delicious. I do love my greens, except I’ve never had collard greens before. I’m up for giving it a try. Wendy, thanks for all you do. Your generosity radiates throughout. I have never made collard greens in the slow cooker! This is such a great idea and I will definitely be trying it. I am so thankful for slow cookers! They make cooking so much easier for us all. And the flavor is really good in the dishes as well. At least that’s what I think! 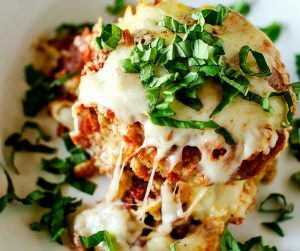 This recipe’s something that I’d love to try! I love using my slow cooker but I’ve never tried preparing this recipe yet. 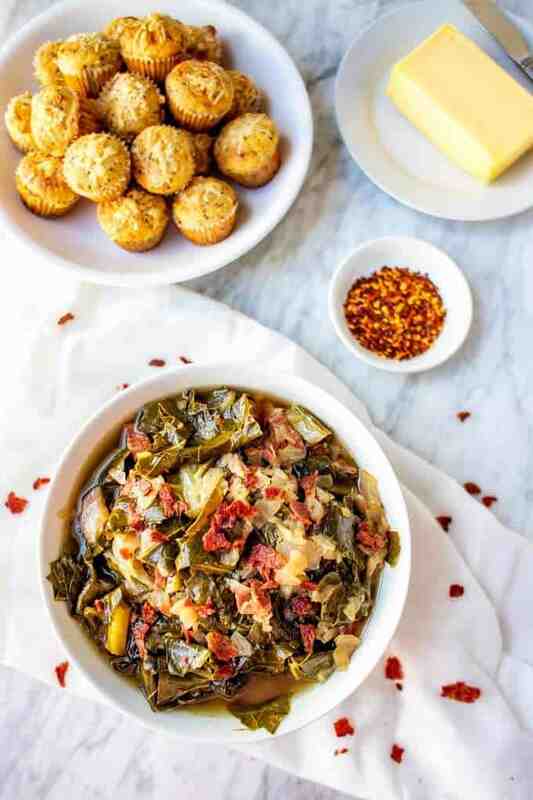 I love collard greens so I will definitely give this a try soon. Thanks for the recipe! Collard greens are one of my absolute favorite foods, but can you believe I’ve never tried them in a slow cooker? I’m out of the country now, but you can bet that as soon as I get home I’m going to give this recipe a try. Oh, That looks soo good! I know that Collard Greens are popular in the USA, but I have never tasted them.